When you comment on a document, presentation, or spreadsheet and use the @-sign with someone's name, the person you mention receives mail with a link to your comment. Clicking the link brings them into the document and into the conversation. Sign in to Office 365 with your work or school account, and go to a document that's saved in a SharePoint library or OneDrive for Business. Note: For this feature to work, you'll need to be signed in to Outlook on your PC. 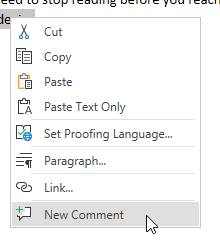 Add a comment from the context menu or from Review > New Comment. Type @ and the first few letters of the person's first or last name, and then pick the name you want (If they don't already have permission to open the document, you'll be asked to provide that). Tip: To be more casual, feel free to delete everything except the person's first name in the @mention. To include more people, type @ again and mention someone else. Note: For this feature to work, you'll need to be signed in to Outlook for Mac. Sign in to Office.com with your work or school Office 365 account, and go to a document that's saved in a SharePoint library or OneDrive for Business. Note: Tenants with conditional access will not be able to create @mentions. Please contact your IT Administrator for more information. 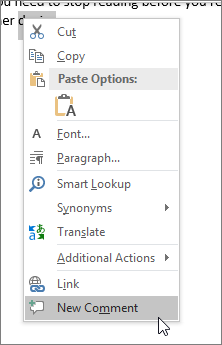 On your device, go to a document that's saved in a SharePoint library or OneDrive for Business. 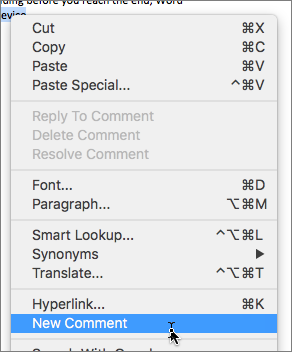 Select words in the document, and then tap New Comment. When someone mentions you in a comment, you'll receive an email notification. The mail includes a link that takes you to the comment in the document or presentation. Tip: If you're mentioned more than once, we'll batch the links into a single email.